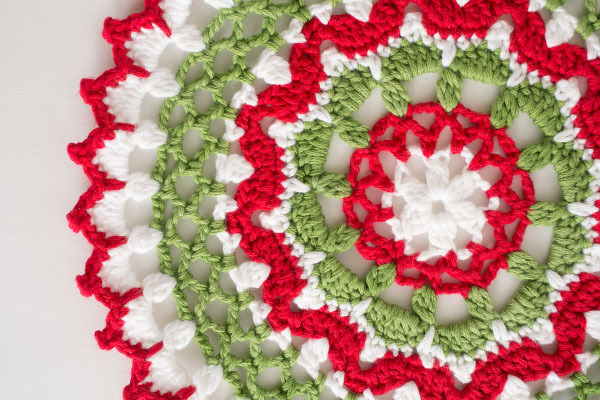 Accent your table settings and side tables with this intricate (but not too complicated) tabletop doily. 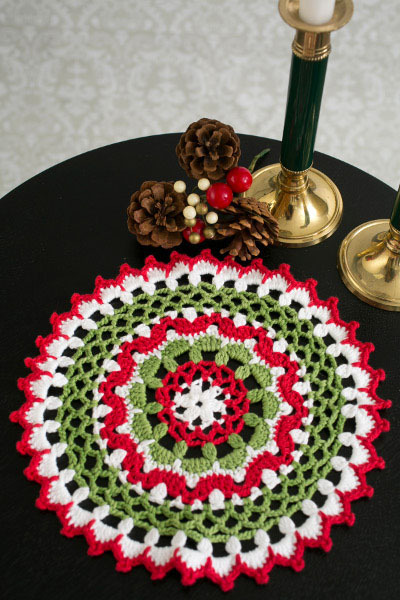 Perfect for use as a coaster or simply as a decorative piece on its own, this holiday doily is sure to set the festive tone. dc-cluster: * yo, insert the hook into the next st, yo, draw the yarn through st, yo, draw the yarn through 2 loops on the hook. * Repeat from * to * 3 more times. YO and draw the yarn through all 5 loops on the hook. 2 dc-cluster (2 dc-cl): * yo, insert the hook into the next st, yo, draw the yarn through st, yo, draw the yarn through 2 loops on the hook. * Repeat from * to * 2 more times. YO and draw the yarn through all 3 loops on the hook. 3 dc-cluster (3 dc-cl): * yo, insert the hook into the next st, yo, draw the yarn through st, yo, draw the yarn through 2 loops on the hook. * Repeat from * to * 3 more times. YO and draw the yarn through all 4 loops on the hook. With white make foundation ring: Ch 6, join with sl st to first ch to form ring. Rnd 1: Ch 2, 2 dc-cluster in ring, [ch 4, 3 dc-cl] in ring 5 times, ch 4, sl st into top of 2 dc-cluster. Fasten off white. Rnd 3: Ch 1, sc around post of dc, *ch 4, sc in ch-4 sp; rep from * to last ch-4 sp, ch 2, dc in 1st sc. Fasten off red. Rnd 4: Join green in any sc. Ch 2, 2 dc-cl, [ch 4, skip 3 chain, 3 dc-cl] 12 times, sl st in 2 dc-cl. Rnd 5: (Sc, [hdc, 3 dc, hdc] in ch 4 space) 12 times. Join with sl st to sc. Fasten off green. Rnd 6: Join white to hdc to the left of sl st of round 5. [3 sc, picot, 2 sc, long sc into top of cluster of round 5] 12 times. Sl st to first sc. Rnd 7: Join red to any long sc. [3 sc, skip 1 sc and picot, ch 5, 5 sc] 11 times. 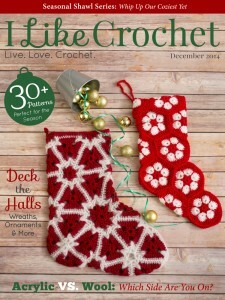 Skip 1 sc and picot, ch 5, 2 sc. Sl st to first sc. Rnd 8: Ch 1, 1 sc in same space, 2 dc, (1 chain, [1 sc, 3 ch, 1 sc] in ch 5 space, 1 chain, 2 dc, 1 sc, 2 dc) 11 times. 1 chain, [1 sc, 3 ch, 1 sc] in ch 5 space, 1 chain, 2 dc. Sl st to first ch. Fasten off red. Rnd 9: Join white. Ch 2, 2dc-cluster [skip 2 dc and 1 chain, ch 2, 1 sc, ch 3, skip 3 chain, sc, skip 1 chain and 2 dc, ch 2, 3dc-cluster in sc] 11 times. Sl st to 2dc-cluster. Fasten off white. Rnd 10: Join green in 2 chain to left of cluster. SC, *ch 4, sc in 3 chain space, ch 4, sc in 2 chain space, ch 4, sc in 2 chain space* repeat from * to last 2 chain space before starting chain. Ch 2, dc into starting chain (count as ch-sp). Rnd 11: Ch 1, 1 sc around post of dc [ch 4, sc into 4 chain space] 34 times. Ch 2, 1 dc into sc at beginning of round (count as ch-sp). Rnd 12: Ch 1, 1 sc around post of dc [ch 4, sc into 4 chain space] 35 times. Sl st into sc. Rnd 13: Join white in any sc. Ch 2, 2dc-cluster in sc, [skip 4 chain, ch 3, 3dc-cluster in sc] 35 times. Sl st into top of starting ch 2. Rnd 14: Sl st into 3 chain space. [sc, hdc, 3 dc, hdc, sc in 3 chain space] 36 times. Sl st in sc. Fasten off white. Rnd 15: Join red to hdc to left of sl st. Sc in hdc, 2 sc, 3-chain picot, 2 sc, skip sc, long sc into top of clusters of round 13. [Skip sc, 3 sc, 3-chain picot, 2 sc, skip sc, long sc into top of clusters of round 13] 35 times. Sl st into sc. Fasten off red.